From left to right: Zephyr Morrison, former YLTA student, Lynn Tilden, (SAP at Lin-Wood & Thornton Central School), Kelly Renaud (SAP at White Mountain Regional), Sean O'Brien, Lori Langlois. Youth Leadership Through Adventure to be featured on NH PBS Roads To Recovery. Sometimes reducing the incidence of substance use disorder means getting kids outdoors. Exposing teens to outdoor activities can set them on the right path. And it creates leaders. "Instead of getting a high from substance use, they get that high from rock climbing or backpacking," said Sean O'Brien who founded Youth Leadership Through Adventure. In his seventh season at Youth Leadership Through Adventure, student advisor Noah Schoenbeck encourages other teens to explore the outdoors, "When I joined this group I was not the person that I am today. I was struggling in school, I was going through hard times at home and I was barely motivated. Now I've found my passion in the outdoors." Sean’s willingness to share his experiential education background and vast knowledge of leadership training has impacted my teaching allowing me to engage my students on a deeper level. Sean is one of the most respected educators and facilitators I have worked with in my fifteen years of education. He has impacted my students, my school and my own teaching in a way that I could have never imagined. I had the privilege of presenting the award on behalf of the regional superintendents. The North Country is very fortunate to have Sean in impacting the lives of students. He has proven to be resourceful, seeking out funding, in-kind support, and other resources to make programs and events happen to benefit students. But there is more than that which makes him a true champion for children, and that is how students regard him as a champion. When you talk with students involved with the Youth Leadership through Adventure work, it’s clear that Sean’s efforts are making a positive impact. While at a recent regional middle school conference at Highland Center that high school students were facilitating under Sean’s guidance, I was chatting with a few school counselors about how the conference going. The conversation quickly turned to Sean and how good he is with middle and high school students, with one person saying “You really need to have that AGF”. I gave a puzzled look and asked what that was. The counselor responded, “You know, the AGF, the Awesome Guy Factor”. The AGF is certainly a fitting description of Sean. I felt honored to present the North Country Champion for Children Award to the awesome, yet very humble guy, who is doing great work on behalf of all the schools in the region. -Lori Langlois. 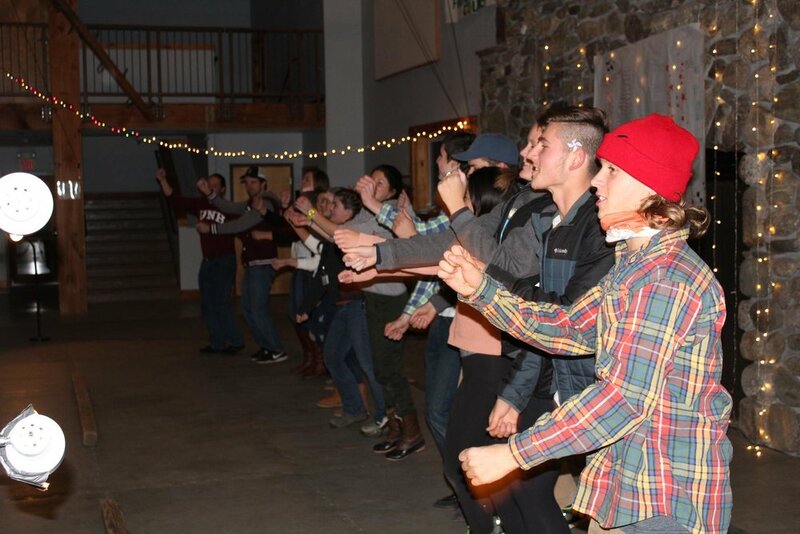 The YLTA North Country Leadership Conference was held on November 10th-12th. This 3 day conference was held at The Hulbert Outdoor Center, Fairlee, VT.. The conference involved small and large group activities, content workshops, and action planning for school-based substance misuse prevention and school climate strategies. Eleven High Schools from around the North Country were represented in this years conference totalling over 150 participants from all across central and northern NH. This conference was facilitated by youth leaders from the Regional Youth Leadership Through Adventure group. The Regional YLTA is a collection of student leaders representing all eleven North Country schools in weekly meetings where they discuss and plan strategies with their peers to improve school climate and prevent substance misuse in their own schools as well as practice facilitation skills.